It’s not often that I stumble across a college blog that I can get really excited about. Today I am happy to share a great resource that stands out from the crowd. I urge everyone to check out DIYCollegeRankings. 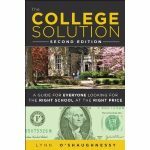 DIYCollegeRankings (the DIY stands for Do It Yourself), which was created by Michelle Kretzschmar, a former data analyst and the mom of a college sophomore, lets you hunt for schools based on what priorities are most important to you. I’d suggest that the most valuable part of Michelle’s website is the spreadsheet that she developed that will allow you, in effect, to create your own college rankings. Instead of taking your cues for US News & World Report’s college rankings, you can develop your own criteria for what you consider to be important. Michelle pulled the data that she uses for her spreadsheet software from the vast federal Integrated Post-Secondary Education Data System, which everybody in the higher-ed world refers to as IPEDS. The federal College Navigator and College Results Online websites – two sites that I like to use – both rely on IPEDS. Has a four-year grad rate of at least 70%. Accepts more than 50% of its applicants. Accepts AP or dual credits. What About Other Search Engines? Now you might be thinking that there are other search engines from places like the College Board, College Navigator, COLLEGEdata, StudentAdvisor, that allow you to search for schools by criteria, but these sites can be limiting depending on the search you want to conduct. Michelle illustrates this with the following chart that focuses just on the size criteria at various popular websites. 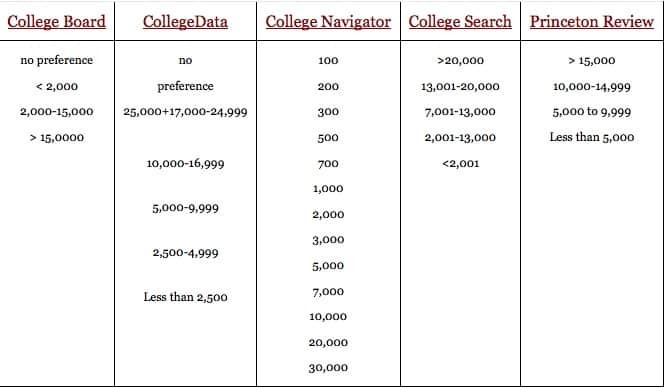 In Michelle’s chart below, for instance, you couldn’t look for a school with 2,500 students at the College Board website; you’d have to hunt for schools that range in size from 2,000 to 15,000, which I’d argue would generate too broad of a search. There are some criteria that DIYCollegeRankings doesn’t offer because IPEDS doesn’t collect it. The biggie that is missing is what percentage of financial need does an institution typically meet. This statistics comes from the Common Data Set, which is used by collegiate publishers like US News and the College Board. This data, by the way, is self reported and I’ve found that statistics at some schools are fishy, but that’s another story. Of course you could head to the original source and use the IPEDS search engine, but I can tell you from first-hand experience that this is a nightmare. When I’ve tried in the past, I had to get someone from the federal government to help me and I received different directions both times that I called. One woman who was “helping” me was unbearably snippy. When I tried to use the IPEDS – the ultimate consumer unfriendly tool – on my own, I gave up. Michelle is selling her college rankings spreadsheet for just $40, but you can get a free trial use of her tool. Even if you don’t like crunching numbers, there is plenty of other information on DIYCollegeRankings. For instance, Michelle regularly highlights schools that have an acceptance rate of at least 50% and a four-year graduation rate of at 50% for private school and a five-year grad rate of 50% for public institutions. Her son is a baseball player so she also has a lot on her site about finding colleges that have baseball teams. Her website mostly attracts baseball families, which I find puzzling since her website is so valuable for families of all college-bound teenagers. Numbers can only get you so far. Tomorrow I will share what process Michelle used to find a wonderful college for her son. I was pleasantly surprised to discover the identity of that college. Lynn O’Shaughnessy is the author of the second edition of The College Solution: A Guide for Everyone Looking for the Right School at the Right Price, which was released this month.